Although the purchase price of an EV is normally higher than the purchase price of fuel cars, the time has come where EVs are now evening out in terms of costs: the Total Cost of Ownership (TCO) of an EV is lower, according to the report from the International Council on Clean Transport (ICCT). The report studied the cost factors of owning a VW Golf in five separate European countries - Norway, Germany, France, United Kingdom and the Netherlands. Despite the fact that only a VW Golf is included in this research, it signals the start of the EV revolution in Europe. The study examined the purchase, fuel and tax costs of the VW Golf in four different versions: fully electric, plug-in hybrid, petrol and diesel. 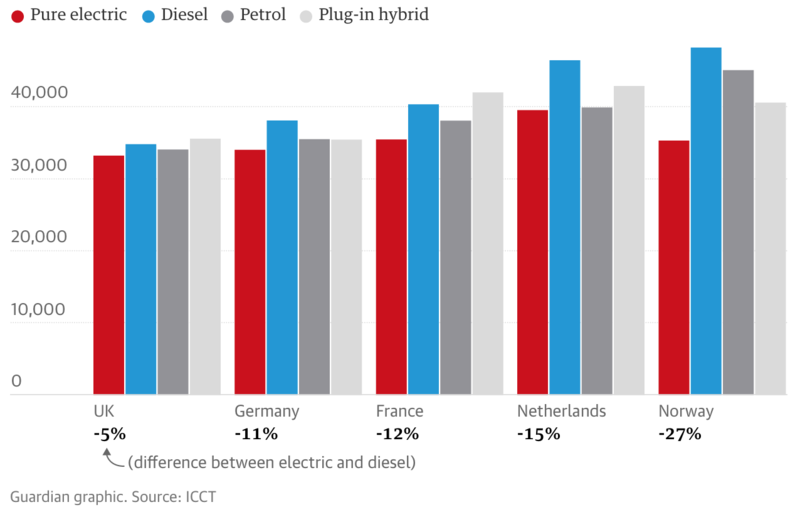 The graph below shows the difference between electric and fuel cars, where the vertical axis shows the costs associated over four years for a VW Golf in all five countries. Over a period of four years, fully electric cars were the cheapest in all five countries because of tax reduction, cheaper fuel costs and subsidies on purchase prices. In particular, the rise of the EV industry and the lower costs of owning one have been stimulated through government grants and tax reductions. InsideEVs, Jalopnik and Oilprice confirm ICCT’s report with their own findings on how EVs are cheaper compared to non-EVs. In general, fuel costs for EVs are significantly lower compared to fuel costs for petrol cars. Jalopnik calculated that you can save more than £1,000 per year on fuel costs driving a Tesla Model 3 Performance instead of an Alfa Romeo Giulia Quadrifoglio. Not only is regular fuel more expensive, but hydrogen cars also lose to EVs with respect to fueling costs, according to Oilprice. Coming from water, hydrogen seems to be a cheaper fuel. However, it requires an additional external source to split the H2O molecules into hydrogen and oxygen. This process is not developed in an optimal way and therefore results in a more expensive fuel. Besides fuel costs, tax reductions take a great part in the lower TCO for EVs. For example, InsideEVs shows that the rest of the world can learn from Norway’s tax system. In Norway, EV drivers benefit from tax savings, which results in a lower purchase price and a lower overall TCO. This tax system stimulates Norwegians to drive electric and will eventually bring the government a step closer to reach their sustainability targets. Another Norwegian government policy is the bonus payment scheme for high-emission vehicles. The Netherlands is also using this policy to encourage people to drive electric. Fortunately, more and more European countries have made financial incentives available to promote the EV industry, such as the OLEV grant. In short, petrol fuelled cars are not the cheapest options anymore and neither are hydrogen cars: EVs are taking over the market. Let’s power the e-mobility movement together!